We’re celebrating 30 years of Brush Busting Power with a special limited edition of our most popular model! For this PRO-26 we partnered with Kryptek® to create a one-of-a-kind mower in cutting edge camo. You get everything on the standard PRO-26 (14.5 HP) plus an unforgettable look! 30th Anniversary Limited Edition Camo Model! Power Steering makes the 14.5 PRO-26 the nimblest DR of all. Each wheel has an independent disc brake that lets you turn on a dime. Plus, if you're mowing across slopes, you can feather the uphill brake to improve the machine's tracking and traction. 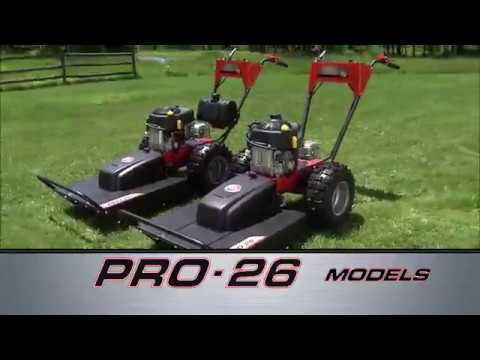 The PRO-26 is a great choice for hilly properties because it includes a full-pressure oil pump–so you can mow on slopes of up to 20° and be assured of plenty of good lubrication to all parts of the engine. This engine also gives you the convenience of convenient turn-key electric starting, so you never have to leave the operator's position to start or stop the machine. This model's extra displacement (481cc vs. 344cc for our 10.5 HP model) also provides the extra "oomph" needed to power through saplings up to 2.5" thick! Kryptek is the industry leader in tactical hunting camouflage. Proven on the battlefield and in the backcountry, Kryptek’s multi-level camo pattern creates a 3-dimensional effect to both the human and animal eye. It’s applied with a special technique that fuses the ink (at the molecular level) into the powder coat to ensure a tough, durable finish that is resistant to scratching and fading. The legendary power, performance and durability of Briggs & Stratton® engines make them the obvious choice for our Walk-Behind Field and Brush Mowers. With the PRO-26 14.5 HP model, you step up to a Briggs Intek Series OHV engine, with full-pressure oil pump (great for positive lubrication even on side slopes), spin-off oil filter, 481 cc of displacement, cast-iron cylinder sleeve, and easy, turn-key electric-starting. The 26" deck is wide enough for effective clearing, but is still very maneuverable. Unlike rigid, fixed decks found on some mowers, the DR deck pivots from side to side, allowing it to follow the contours of rough terrain. This feature minimizes scalping and improves traction. This is my second DR Brush Mower. The first one has a Kawasaki engine. This one has a Briggs. The location of the dip stick is a big problem on the Briggs. Each time I mow high brush the dip stick gets knocked lose unscrews. It sticks up too high with no protection. This never happened with the Kawasaki. I am not pleased with this problem. The machine is top quality except for this one big problem. I had the very first model of the Brush Mower 1989 and used it for years. It was great but the new model is way better. Great equipment and does what it says it will do. Used my new brush mower to cut three one acre food plots in Covington County, Alabama. The year old plant growth was cut down with ease. I took before and after pictures of the fields and they look great. I carried it in the back of my pickup truck from SC to AL. Easy to load and unload. I would add one step to operating instructions: Open fuel shutoff valve before operating. Pro 26 14.5 HP is a Beast! I ordered the Pro 26 14.5 Hp on Sunday afternoon and it was on the truck dock waiting to be picked up in 8 Days. Excellent service. The machine was Shipped in a very secure crate and easy to assemble. Started up immediately followed all the start up steps and put it right to work. Amazing power,went after some one and two inch saplings I have along a creek and it had no problem with them. Cleared away several areas on property that were over grown the Pro-26 has been clearing everything just as advertised.The power steering works great so happy I added that ,makes turns super easy...Very happy with machine. I have 4 acres that’s along a deep creek bed that is overgrown in places having a great time getting it cleaned up to enjoy a better view. This machine does a really good job cutting and handling thick brush and steeper slopes. The only reason I didn’t give five stars is due to I have had to replace some bolts that came out of the control panel during the first hour of use. It mowed over the overgrowth on our property like butta. My wife and I were clearing walking/cross country skiing trails through our woods and the DR field and brush mower took on the job with no problem. Saplings were no match. Definitely would recommend. I like this mower, it's easy to use and I love pulverizing the brush in the woods. I mainly got this to level off the overgrown brush in the woods behind my house. I hope this machine will be an great tool for future use. This our second brush mower if it lasts haft as long as the first one it will be great. We had the first one 18 years and my son is now using it. I gave it four stars because like the first one reverse is too fast for old bones. We have lots of trails on our 80 acres and it keeps them clear all summer. Best brush mower purchase ever. I have 10 acres in woods and fields. The woods are chocked with understory and the fields are overgrown with tall, thick grass. The DR Field and Brush mower make short work of taking this down. Our summer in south central PA has been very wet and cutting the grass and. brush has allowed the areas to begin to dry. The mower is doing exactly what I hoped it would and it's the best tool for the job. I have 6 acres of West Texas brush to deal with. Although I have a tractor mounted mower, there are a lot of places where it isn't effective. Thats where the DR comes in. Next to buildings, fence lines, over septic fields, this mower is awesome. I had some issues with one of the hand brakes, but overall this is a great product. What used to take a weekend of hand tools and weedeater, can now be done in less than 4 hours. Great Machine. The 14.5 HP can CLIMB hills with power to spare. Just wish I had bought one 5 years ago! I am in my 80's and the DR Field & Brush Mower is really nice to use on the 5.8 acres around my home. I have used it twice and it is as expected. Set up smooth. Instructions clear. Just what I wanted. When I saw it I thought it would be too heavy for me, but it is not. Well balanced. No complaints. Good mower and does the job. Order & delivery was easy. I have not been able to test it as for really tall grass and brush cutting yet so please ask again in another month but so far i love it! Easy to set up and do maintenance on and i look forward to getting an attachment and the chains for muddy use. Machine worked as expected. Bent the brake rotor and destroyed the caliper after hitting an unforeseen object while turning. Getting repair parts took a while. I also added an hour meter. Should make the hour meter a standard item on all machines. Would be a 5 star for the machine, 3 star for service. This machine is AWESOME! I have really heavy brush and every bit of 2-1/2 saplings and the DR took them down like it was nothing. The bigger stuff, it just crawls up the tree until the blade catches it and down it goes!!! I cleared a half acre in about 2 hours. Awesome...btw, I used the optional heavy blade. Better than my first one. Independent disc brakes make this machine much easier to turn for an older person as myself.easy to assemble. I’m very impressed with the machine. Assembly was fairly easy. I wish I’d known it didn’t come with oil for the engine. The “power steering” takes some getting used to but works well. I would recommend this mower. good product so far. Have used for two days since I only took delivery 5 days ago. Plenty of power for rough brush. If you can run it over, it will chop it up to domed degree. I do wish that I could drop it down lower, but it’s hard to complain. Low gear is all you need moving forward - you’ll pop a wheel in 3rd gear! I’m not sure that you’ll cut down two inch diameter saplings, but you can do almost anything else. Excellent product especially for the price. Have put this machine to the test and it passes with flying colors !!! Just put in my first 5 hours. Really should have a before and after pic to show how much got done. Ditches, slopes, grass, heavy brush. Don't let the ads fool ya - this can be a workout depending on your conditions. But I can't wait to do more. I also have the 42 blade coming for snow - tentatively doing the job on 1500' of gravel road rather than buying a plow for my big Dodge Ram. My perception is it'll do well. Sales was terrific, spent time with me, offered tips and discussion. I had two reasons to call tech support, both minor, and in both cases they were prompt, helpful, and on-point. One wish: I wish the shift selector had a stronger detent to it so you could be a little more certain you've clicked into the desired gear. Changing gears takes more attention than it should. This is my first DR product and definitely not my last. Within a week of owning/using around my farm I am very happy. 6 foot tall weeds and blackberry bushes on steep slopes and it doesn’t slow down. Power steering is worth the extra money for the upgrade. Very happy with my purchase. I just picked up my new PRO-26 yesterday from a local dealer. Today I assembled it and found that everything seems to work except that it won't drive the wheels. The cable adjuster is adjusted all the way out and the belt just isn't being pulled tight enough to drive the wheels. So they are sending me a new drive belt. Disappointing start. I'll update my review based on whether the belt fixes the problem. Response from DR SupportThank you for contacting us and taking the time to write a review. We're sorry for the disappointing start and hope that the belt was the fix needed. If it isn't, please let us know, we want to make sure you're happy with your Field and Brush Mower. This brush mower tackles blackberry brambles, small alder trees and brush with no problem. Performs as advertised. Very pleased with the overall purchase. I have been very pleased with this machine. I have used it to clear areas I thought would have to be done by hand and could not ask for better. I thin it is well worth the price. It is easy to use if you follow directions and keep safety in mind. Used once to cut 2ft tall grass, worked great. It is easy start and power steering makes it easy to operate. My daughter runs it. Grass balls up under the mower because it has no side outlet! Had to tell what gear its in as it has such a soft shift, should have a click.they all need a hand protection device, I've skinned my hand several times. The mower works very well. The individual wheel brakes make it easier to handle than the DR mower which I had for almost 18 years. I am well satisfied with the new one. As expected the DR is great. I was unhappy about the difficulty I had trying to determine the delivery day. Finally found out an hour before it was delivered. No call from trucking company or tracking number that worked. I’m very happy with DRMower but it is heavier than I expected. I am a 66 yr old woman and the videos show it moving quite easily. It is easy on flat ground but more difficult in rough patches. It is the machine I need to clear brush but wish I bought it 20 years ago ! I cut five acres of yaupon on bumpy ,uneven terrain in about eighteen to twenty hours total work time. Was able to maneuver around and between the pines and oak without too much difficulty. Definitely recommend the power steering option. I would like to have a second gear that’s a bit slower than the current one. The lock knob on the plastic belt cover loosened and was lost first time out. I replaced it with a lock washer and bolt that has stayed put. The fabric deflector on front shredded off in a few days. Both minor issues that don’t affect overall performance. Overall I’m highly satisfied with the machine and would recommend to anyone . The field and Brush mower got the job done and I have been very pleased with it. Works really well, cuts thru honey suckle vines and saplings with ease. Only problem was instruction manuals blew off pallet during transporting to my home, had to go back and find them. Bad shape but readable. Suggest taking them off pallet after picking unit up. Called and received new ones in a couple days. I am 70 years old and this machine is great for me. I have 3 horse pastures to mow down. Just could not use a push mower ANY more. Cuts through the four foot weed great. An awesome machine. It’s everything I was hoping it would be. My 4 acres overran with 30 years of neglect brush and briars. Mower is a mini brush hog. Cannot overemphasize need to use care when in reverse mode look behind you to make sure there is room for a reverse maneuver first. machine works very well. I've only run it about 6 hrs. I purchased the timer/tach and am very happy. the engine backfires occasionally but overall I give the unit 2 thumbs up. This mower is just what we needed. Only used it for a few hours but it is rugged and does the job. Really like the electric start and power steering. Very pleased so far. The machine 14.5 hp AT4 is a powerful workhorse and definitely performs in the field as advertised. However, in 2 weeks we have mashed the neutral safety switch, wrecked the drive belt, and snapped one of the shift cables. The bolts attaching the safety cage to the muffler shook themselves free and are lost in the field. The oil filler frequently unscrews itself and twice jumped free of the machine, causing oil to be splattered all around. I feel that too many wires, hoses, and other parts like the neutral safety switch are unprotected and therefore vulnerable to damage when driving into a thicket of wild rose which is largely what we're dealing with on the project we purchased the machine for. So while I think it's the best machine available for the money, and certainly can handle some rough terrain, a well placed skid plate and front shield would have prevented most of the problems we've had with it. I do not regret the purchase, I just see areas that need improvement. Also - your parts and service people I've dealt with Tammie and Ken, are top notch! I have used my new DR PRO-26 in my residential yard 3 Acres to remove brush and over-growth in the natural areas. Worked completely as advertised and easy to use. I plan on taking it to my mountain property 6 Acres and clearing tall grass and brush. Highly recommend. Suggestion: go for the pivot deck, power steering, and electric start for ease of use. I had some areas on the farm that I could not get with my tractor and bush hog but with this machine I was able to get into those areas and get the briars and small trees cut down. Great asset to our family farm. Will use this machine on a regular basis. Shipping to my residence and setup went flawlessly. I got this DR PRO-26, 14.5 HP Electric-Start model to replace a 40 year old Gravely walk behind. I chose this one after researching other brands. I think I bought the right one. In the last few weeks since I bought it, I've used it on my hilly 100 acre wooded property to mow down multiflora rose, poison ivy and saplings. It did the job without much effort on my part. The power steering feature is great. It keeps the machine going straight when cutting sideways on hills. The transmission holds the machine back when cutting downwards on steep hills no breaking required. The electric start is appreciated at my age. The tires are large enough to climb over hidden fallen limbs, etc. In short, I'm very satisfied so far. The machine is very well designed, both ergonomically and materially. If the belts hold up reasonably well, I think this mower is a keeper. A PS... When I went to lower the adjustable handebars, I couldn't see the extra holes. Turned out they were there, just hidden by the flange on the upper bolt. When lowered , the result was perfect for me. PPS.. a full size semi delivered the DR at my rural residence. He stopped on my seldom used county road. I used pallet tines on my tractor loader to unload. Process took less than 2 minutes. Could have been a problem if I didn't have that equipment. Be warned. So far only 4 hours of use this machine is a beast! I bought the Heavy Duty blade because most of what I am clearing is heavy Brush and saplings. have not had to use it yet. the regular blade mows everything down with little hesitation. not a nick in the blade either and I have cut a lot of saplings. Highly Recommend this machine. Great machine for cutting the 2 ac of blackberry pasture. Mows shrubs, thick blackberry, clumps of grass easily. I mowed the area in about 4-5 hours in stages. Figured I saved the 200-300 each time I didn’t have to hire a brush mower with tractor. Got the 14hp, 26” cut with electric start...plenty of power...more than enough. The reservation: for us older folks I’m 73 or people of small stature when they offer the power steering buy it. I didn’t and it would make using the machine a LOT easier That’s the only drawback to my purchase. I bought mine 18 months ago and I love it. You have to man handle it a bit but I'm ok even at the age of 62. Now I see they have this one with power steering. Easy to start and maintain. My driveway is 1700 ft long uphill thru the forest and it needs clearing because of the growth a few times a year. It will consume just about anything I run over without bogging down. I actually enjoy clearing the path because the DR Field and Brush Mower makes the job easy. I wouldn't trade it for anything. The capabilities of this machine continue to amaze me. I need to regularly clear brush from rugged terrain adjacent to tidal marshes. The soil is interspersed with small pools and rocks. I thought only weed eaters with chain saw blades could deal with these conditions. The brush mower conquered all with no difficulty and in two thirds less time. Works great ?? cuts great. Should have purchased it years ago, plus the ease of changing, attachments. This machine helped me mow down 2 acre's of tumble weed brush, Mesquite tree saplings,field grass & stir up a helluva lotta' dust in 2 days. Well built. Noticed that when mowing in thick brush/tree area'a that the top-mounted oil cap will get snagged from branches & work loose. So you have to keep an eye on it. Outside of that little thing... The mower Kicks A**. This is just what my husband wanted. Works get. I have used my brush mower several times and feel confident it will do the trick every time. I just push though any brush and it takes care of it. This is an indispensable tool for anyone who owns untamed land. Had a few acres to clear, weeds 4 to 6 ft, tree saplings mowed them down no issues. Would show before and after pictures but no way to attach. The brush mower is a great piece of equipment. Would recommend to anyone. Where is my original review? Shame on you guys! Response from DR SupportThank you for contacting us, Joseph. In no way are we trying to edit our customers. We appreciate all feedback, comments, and suggestions. Our customers are the ones using our machines in an everyday application. As with everything, there is always room to grow and improve. We have looked through our system for the original review that you speak of and do not see it. Reviews are never deleted from the system, but we are unable to find another one with your name or location for this machine. Again, we appreciate you taking the time to write the review and welcome all feedback. I gave it 4 stars because the speed select is a bit tricky. I found out if you can't get into the speed you want pull down to neutral and come up to it. Works great. Other than that this machine is awesome. There is an learning curve to using it. When cutting a "rated tree (2.5")" raise the head and chop it. Stop! and back up and come back in at ground level to cut the stub or it will hang you up. Also make a mental note of where everything is on your engine. I had a branch come in and pop the connector off the carburetor. Killed the engine and would not start until I figured it out. This a great machine and fun to operate. I have about 1.5-2 acres of Himalayan Black Berry Bushes on my property that I just moved to. I did a lot of research on how to get this invasive species under control without poison. After trying to tackle them by hand and pulling out the roots with not much success I decided to spend the money and buy the Pro-26, 14.5 HP electric-start DR Mower. I'm glad I did! This thing chews thru them and mulches the vines up very well. These black berry bushes are dense and about eight feet tall and this thing handles them very well. It's hard work but very satisfying seeing these bushes destroyed. The mower doesn't bog down or die. You have to go at the bushes straight out and then reverse and go at another angle, but it makes fast work getting rid of this stuff. Since these bushes are so dense and tall I have accidentally hit some concrete and boulders, but it hasn't effected the mower at all. So glad I have this mower.....worth every penny! It cost around 500-600 dollars a week to rent these mowers so you are better off buying one. You won't regret it. Performs as expected and even better than expected. I have the previous model, three years old less than 12 hours. Rod bolt loosened up, engine ruined. Got home with the unit, removed it from the crate, assembled the unit, oiled and gassed it up, inserted the key and it fired right up on the first crank. I like that. I burnished the PTO clutch as recommended in the instruction booklet and away i went! The unit performed just as expected, in fact, it was easier to operate than one would think for a walk behind brush mower. What i especially like is having a bad back, after several hours on my tractor or riding mower i can hardly stand up. With this walk-behind unit it's a lot easier on my back, no kidding. The unit performed really well in tight spots around trees and along the fence line and across the rough spots in the terrain where the tractor is too big and the riding mower beats the heck outta you. The only changes i might make for my personal situation is tighten up the deck pivot adjustment and purchase a heavy duty blade. It's probably a good idea to have an extra blade on hand, just in case. One happy customer here! I have property in S.C and it cleared the feilds I have like a beast nothing seems to stop it. Every thing they say it is IT IS!! The only draw back is the lack of a fourth gear. One and two are very slow, but three is too fast. But It does exactly what I wanted it to do. So I gave it five stars anyway. I'm completely satisfied with this machine. It cuts brush and weeds were my lawn mower can't go. Almost eliminates my weed wacking time. Plenty of power for the hills and heavy brush. I purchased this after looking at Billy Goat and Swisher trail cutters. The DR has a wider stance and is a more substantial machine than both of those competitor's models. I live on a lake with a creek and two ponds that I need to maneuver around and a pull behind bush hog couldn't get in the places the DR can (safely). Overall the machine is my new favorite toy as it will go just about anywhere you are willing to follow it. The buying experience was quick but I chose to ship to a terminal for free and kind of regretted that. The folks at the terminal needed a shipping ID number which I didn't have on me so I tried to call DR and they are closed on the weekends. It would have been nice if DR had weekend coverage customer support. Something to remember if you have an issue on a Saturday; it will have to wait until Monday. They finally found the DR and loaded me up. Assembly was super simple, took longer to break down the crate than it took to put it together. The shift points are kind of hard to detect; you can go from 1st to 3rd and the DR pulls a wheelie if you are in 3rd or were expecting 2nd gear. It will cruise at a fast walk and chomp through anything you put in front of it. Highly recommend but be ready; if you are truly cutting saplings in off camber terrain, you are going to get a workout. Have taken the brush mower out several times and it is a beast! All I had expected! Rough terrain and handles it well! I have had my Pro-26 Electric Start for a couple of weeks now. I have just used it for a couple of hours but it has performed great. The back half of my property is covered with large hardwoods and privette so thick it is hard to walk thru. The Brush Mower handles the privette with ease. The privette is thumb size in diameter to 2"and is about 8' high. The DR goes thru it with ease. Very impressed with this Machine. Transmission works very well.The only problem i have with this machine is on a steep incline it runs out of fuel. I am installing a low pressure fuel pump to correct this problem.Great Machine. We call it a beast. I've owned several different brands of power equipment and am always happy with DR. This brush mower runs great and and is easy to handle. It will be great for the tight spots I can't get into with my tractor mounted bushhog. I have 5 acres of weeds. The dry weeds cut really well but the green ones do not get cut as well. They will lay down as if the blade just pushed them aside. Still this is a good machine and has saved be a lot of time in clearing the area. I will check the blade to see if sharpening it will do any better. One thing that would be nice is if the blade was just a little closer to the ground. I should have purchased the next size up with power steering that would help alot at my age. I've only used the brush mower for 2 days. In those 2 days I cleared more buckthorn and honeysuckle than I did in a month last year with a chainsaw. Since it cuts then mulches, the area is much cleaner and I'm not tripping on fallen saplings. I've cut grass and invasive saplings up to 2.5". The product will do everything it advertises. A full gas tank will run for hours. 2 years ago I requested the brochures but just couldn't pull the trigger to purchase. That was the biggest mistake I made. It will take me approximately 10 days to complete clearing all the invasive plants on our property with this machine. Then I'll use it primarily for maintaining high grass to start food plots and maintain pine plantations. Awesome product that I should have bought sooner. I have had a need to clear a thicket of Spirea. This variety is considered invasive and it was doing that. The DR went through the patch without breaking a sweat. Great machine. We received our mower, unpacked it from the crate, added oil and gas and cranked it up. It ran beautifully for about 45 seconds, then stopped with a hard "clunk". Uh-oh. We called DR and were guided through the warranty repair process by very knowledgeable DR staff. We took the machine to a local dealer, who took it apart and found that the engine had thrown rods and basically self-destructed. I guess it was a faulty engine from the get-go. It was covered by the warranty, and Briggs and Stratton (the engine manufacturer) sent a new one the next day. The shop was able to replace the engine and get it back to us in working order within a few days. It was a hassle, but these things do happen, and DR handled it well--very helpful through the whole thing. Now the mower runs like a dream---really tackles the high grass and easy to use, even for a not-very-strong person like me. Even with the engine malfunction, I highly recommend the machine and certainly DR's service and commitment to technical and logistical support. The mower arrived today. I got a 'scratch and dent' deal. It was easy to set up. I have 14 acres, much infested with invasive bittersweet. I cleared some paths with my tractor and pto bush hog, but I needed something smaller to get to the hard to reach places where it's not safe or practical to bring a tractor, eg by streams or in the woods. That's where the DR mower comes in. Wow. This thing is amazing. It surpassed my expectations for it's ability to mow through thick and tangled vines, decades old. There were areas I had given up on, the tangles were so dense. I started attacking them for shits and giggles, just to see what the new toy would do. It created new paths in minutes. In the first hour of use, I used every feature - multiple mowing speeds, the diff lock, frequent forward and reverse motions. I value a well-designed product. I could tell the mower was the culmination of decades of refinement. Highly recommended. The field and brush mower is all I expected it to be. i used the Brush mower for the first time a few weeks ago and was very pleased in the overall performance. It handled everything it was advertised to do and with extreme ease. This is a well built piece of equipment and if you have some tough brush to take down i highly recommend this machine. After researching several different machines over several months we settled on the DR Pro 26 14.5 hp. By no means is this the least expensive machine on the market however so far it has handled everything in its path. I use it primarily to cut trails through wooded and brushy areas on our hunting property and has performed as expected. Thick brush and trees up to about 2.5" not a problem. One additional comment, the gear shift lever is quite touchy between gears 2 and 3 and seems as though there should be a greater separation between the two. This can surprise you if you are not ready for it. Also the battery on the electric start unit is located behind the gas tank "out in the open" where as I would have thought that it would be in a plastic box and protected. I truly had a lot of concerns the mower would slow down and stall when it tried to cut heavy bush. The engine doesn't even change rpm; it goes through just about anything without any problems.Yes, it takes some getting use to and I learned quickly first gear and slow is the word or you will just climb up the larger bushes and saplings. That said its' a quality built unit with a proper balance and the tires are fantastic for traction. I've' found that even in second gear at full throttle the unit moves too fast to keep up with; there is more than enough power in this engine. Right out of the box it performed just like the video. Some areas on the farm wasn't cut in years. Thanks DR.
Works great as advertised. Quick start and easy handling. Made quick work of our brush and saplings! I recently purchases 5 acres of property and built a house one it. The property is mostly pasture, but it has some large areas that don't irrigate properly and the weed are more than happy to grow, like chest high. I quickly realized that a weed eater wasn't going to cut it and started to look for other alternatives. After reading all great reviews on the DR Brush Mower, and some that said that they wished that they would have purchased one sooner, I decided to pull the trigger. I picked mine up at the local freight office, and used a pair of $50.00 Harbor Freight ramps to roll it out of the back of my pickup, by myself. I simply disassembled the crate while it was still in the back of the pickup. I've used it now for about 3 hours, and my son-in-law has used it for a couple of hours also, and we are both really impressed. The electric starter is GREAT, and the power is incredible. I won't repeat what others have said, I'll just say that this thing does everything that the manufacturer says it will do. Bought my first DR in 2001. Machine still runs and cuts great. Upgraded to 2016 model. Machine more streamlined, great that cables are replaced with push knob, handles are simplified to fit smaller hands. Also muffler not protruding on side of machine vs older models. A+ on design and workability. This machine cuts and cuts and cuts. The fuel tank is a bit puny, but after one hour of continuous cutting, you'll want a break anyway. One wants to exercise care when mowing next to a structure. You can pinch your fingers. My only negative would be installing the heavy duty blade. You'll need a good impact wrench to remove the nut that secures the blade to the machine. DR should say so in the operator's manual, but the tech support folks will tell you so if you should call them. I have used this mower for over 4 hours on high heavy weeds - using the string trimmer attachment. My ground is uneven, with hidden rocks, and low stumps. The big tires are seldom stuck on anything. Great traction. I was surprised the mower deck is light, and easy to tip back when you need to change the trimmer line. The heavy trimmer line seldom breaks unless you hit rocks, stumps. or trees. Once I found an easy way to change the thick line, I could replace both lines in a short time. Improvements that should be made - in light wind conditions, you will have to live with the engine exhaust. No way to avoid it. The gears are well marked, but do not have a detent letting you know where they are. Being able to set a speed you are comfortable with would be a big help. On smooth or level ground, anyone can operate this machine. If your working the uneven, rough land like I have, it takes some muscle and hard work to get the job done. The " power steering" makes turning easier, and the big fuel tank keeps stops to a minimum. I will need another month with the whip attachment on, and then will be able to try out the heavy duty blade. A solid machine so far. I am extremely pleased with the Brush Mower! It delivers all anticipated and so much more! I know it will service my little farm for years to come! I was surprised how big it actually is. Equally surprised how easy it is to handle. It meets and surpasses all my expectations. I am really glad I got the electric start. Was hesitant to spend this kind of money but I own a very neglected 13 acre piece of property that is very overgrown in briars, grass and small trees, so I decided to bite the bullet. The 14 HP mower arrived quickly and was easy to assemble. I did add hour monitor and have now put 4 hours on it in less than a week. It has handled everything I asked it to do. Now I can get to my pond and blueberry bushes. This thing is so much fun to operate I can't wait to get out there and clear some more of my land. It's a beast, but I love it! My DR field and brush mower is one of the original ones. I write this review on the newer version, but my mower is going strong. It's at least 8 years old and has been a remarkable machine. I use it to cut and mow brushy woodland and overgrown trails and it powers through foliage and woody growth. Any friend that tries it has to keep mowing...it's addictive. I'm still on the original blade and the only thing I've changed over the years is the oil and one battery. One tire needs pumping up with each use, but I'd say that's a minimal thing to do after years of use on steep hills and rocky pastures. This mower performs as advertised. I have only put about 5 hours on it so far and am very pleased with the results.It handles well and cuts anything I have put in front of it including Multiflora Rose. Life made simpler with my new brush mower. I live in a very rural area on 7 acres, studded with tons of oaks, rolling hills and a lot of rock out droppings and for the past 6 years I've been having to weed whack all of it by hand because I couldn't get a tractor to go through it efficiently or any kind of riding mower without having to go back over many areas by hand. The DR Field and Brush Mower has made my life much easier! I've finally tried it out yesterday and within 3 hours I was able to complete an area that would've taking me 4 days minimum. The brush mower literally plows over the tall grasses and pulverizes the grass just as fast as you can walk with the speed set to 3. It takes a little getting used to the power it offers as well as handling it between trees and hidden rocks but for it's maiden voyage I'm completely impressed. I think this was the best investment I've made so far. I may look into getting the bladeless adapter only because my property has a lot of hidden rocks and when trying to mow over tall grass, it's a little daunting. At age 72, I needed a cutting machine that was easy to operate. This PRO-26 is a dream machine for me on the farm. I used it today for three (3)hours to cut high weeds and it was effortless with the self propelled feature coupled with the balloon tires and the 3 speeds and reverse feature. One of the best investments I ever made! My dad and I purchased one of these to clear shooting lanes and clear for food plots in northern Michigan. It starts easy runs like a charm. If it pushes something over it will chew it up to nothing. We have cut mostly alder and maple. I mostly run the machine in 2nd or 3rd gear. I'm really pleased with the product and have nothing bad to rate it on. exceeded every expectation I had. outstanding performance. wish i'd bought sooner. AS ADVERTISED, the DR Brush Mower is a well-designed and well-constructed piece of equipment. I cut 6 acres of 4 foot grass in 7 hours, I have taken down 8 foot tall thatch that is so tough, the DR mower rides up it like a ramp, only to chew it up on the way down. Ive hit a pipe, wire, rocks and small stumps, and with the incredible balance that this machine has, it pops up and avoids any serious damage. For once, I spent the long dollar instead of going short on a cheaper competitors machine...and its made in America..Great job guys !! The Beast Must be Fed! Easy to set up and a dream to run. Very well balanced and so efficient, at first I did not think the blade was spinning. It was totally unconcerned with the thick invasive Scotch Broom and made short work of Eucalyptus saplings. My only complain is that it is very difficult to know which gear you are in. It's all that I could have asked for. Lots of power, cuts 1.5" buckthorn easily. I bought my DR PRO - 26 brush cutter for removing yaupon brush on our place in the woods of East Texas. The brush is thicker that what my sickle bar mower can effectively cut. I didn’t really attack 2.5 inch brush, which is advertised, but did some 3/4 – 1 inch with some difficulty. I spent many hours over two days cutting brush and was very pleased with the results. The DR made a terrific difference in the cabin surroundings. Gas mileage was excellent and a tankful lasts for many hours. Tires with deeper treads would be a plus in our soft soil, especially after recent rains. This model lacks adjustment holes shown in the book for handle height change. Turns out the fixed height is o.k.. A design change should be made to eliminate the vulnerability of the small white connector on the right side. Attacking brush separated that connector which killed the engine. It was 80° and I thought it was heat induced vapor lock. It wouldn’t start later after a ‘cool down.’ My daughter came to help and noticed the loose connection. She reconnected and voila! Instant start, our genius saved the day and much trouble. I dreaded thinking of manual loading the machine into the truck for the trip home. I would recommend wearing long sleeves, leather gloves, safety glasses, boots, dust mask and hat. “Free shipping” excludes the $150 delivery charge added on. My DR machine’s name is “DOCTOR” because it is so efficient in brush surgery. I just turned 80 years, handled the machine effectively and had a good work out. Anyone can work one. I live on wooded acreage along a river. The terrain is uneven. This mower has handled the brush by the river so easily. It now looks look a park! Visitors have all remarked how beautiful it looks. Future plans are to cut back the forest around the cabin. I am sure with maitainence mowing, in 4 years or so these areas will be grassy. Best 'toy' I own. Thanks to a friend who recommended it. Great machine. It replaces my 25+yrs old model. Have put it to some hard use already mowing thru 9-10 ft. tall blackberry thickets interlaces with various creeper vines and several 1"-2" trees growing mixed in. I could not handle this job with the old machine. Love the reverse gear for this type of job. My 75 yr. old body loves the elec. start and the 3 forward speeds although 3rd gear is too fast for my old legs to keep up. Where do I start? Let me tell you I never dreamed this brush mower would do the job it did for me! This machine will chew up and spit out everything in its way. I have approx 1 acre on a slope and was overgrown with small saplings and briers, I could not believe how well this mower cut this. The only regret I have is that I should have bought this machine years ago!! Thanks DR!! The DR mower is powerful enough to go through the thickest vegetation. Unlike my prior brush mower, I like that this mower has the tire valve stems facing outward, rather than inward--much easier to access. This machine is a beast at cutting brush and clearing our wooded areas. When it runs it's great, but we have had several problems with the electric start that required repair at the dealer. It would help if it had a manual start backup. Also the wires should be protected better. When running thru the hazel brush we have had instances where wiring got tangled in the brush and pulled out or broke. I find the Field and Brush Mower all that DR Claimed for it. I wish I had ordered the lawn attachment also. This machine is a BEAST! Easy to setup out of crate. Doesn't get bogged down in tall grass at all. I am not sure if I have ever cleared land walking behind an elephant with tennis shoes on, but with the exception of not having to worry about the occasional "yard patty", this would the closest I could come. Exceptional power, very quiet, really tough machine, and nimble as Nadia Comaneci back in the day. This thing wrecks shop with the best of them. I love this machine so much, I want to get one that is even bigger!! I am thinking about "giving" this one to the wife for Christmas and "hope" Santa brings me the 20HP monster version! His and Hers brush thumpers! How sweet! She is going to love it! Superior job DR! I purchased my 14 HP Power Mower about a month ago. Assembly from the crate was easy. Probably less than an hour, and it was operational. I have since mowed some substantial areas of vegetation which included thick stands of live oak saplings up to five feet tall, and heavy grass. It exceeded my expectations. It never hesitated, and buzzed through areas I wasn't sure it could do. It is an amazing machine. Recommend it highly. The brush mower is a rugged piece of equipment that suits my needs. I was disappointed to see that not all of DR equipment is made in the United States. In this case, your reputation influenced my keeping the brush mower. I had the previous 14.5 HP unit for 12+ years. The deck was of a considerably lighter gauge steel, and it was indestructible. They've increased the weight of the overall unit generally and the deck specifically. As others have said, this makes it very difficult to turn and maneuver on uneven terrain and hillsides. I still love the thing and couldn't do without it, but I really feel beat up after a couple hours of wrestling it around. If you have a pasture you can't manage with a tractor get one of these mowers! This will fill in the gap. You can prep for better weed control by mowing before spraying. It's versatile and can be used in rocky areas and on slopes. It handles the deep, thick grass with no problem. Easy to use and dependable. It works for me! I purchased a DR Field and Brush Mower (15 HP Kawasaki) about a week ago. It came with the 6000 watt generator as a separate attachment. It seems it was purchased by a man in 2006 and he passed away before he ever used it. It has been in a garage ever sense. The manual was easily downloaded from the company website. It needed an adjustment because if it was in gear the hand clutch did not disengage. I called the factory who quickly connected me to their technical department. The man gave detailed instructions on how to make the needed adjustment. When I asked about ordering a maintenance kit and another heavy blade he asked me to measure my blade to make sure whether it was a 26 or 30 inch cut. He said he would hold on while I went outside and measured it. It has been a long time since I have received service from a company who could answer your questions and treated their customers so well. They opened a file in my name and transferred all the original manufacturer information for this mower to me. Today was my first day taking it for a spin. Mowing heavy thick grass 12 to 18 inches high did not slow it down. I ran it through some brush and it climbed up and pushed it over and not only cut it but mulched it also. I can confidently say both the company and the machine are top quality. I will purchase other implements from them. My old one of many years gave up. I had one of the first ones with small tires it worked great but time took its tole. I am now using it along with my son and his behind the tractor. Been wanting this machine for 20 years. Outstanding piece of equipment. I love it. What else can I say? The first day I tried it out, I engaged the blade and run the 'hog' into some grass etc. Didn't hear the noise I hear when I take my big hog and hit the grass/brush. Anyway, I thought--what the heck is wrong with this thing, so I backed up and there was a nicely cut strip! How quiet it was. Wish it had some kind of attachment to chase the deerflies away tho. They are holding back progress. This mower does exactly what I wanted ... cut and maintain trails through a woodland ... over rough ground and a variety of veg including small saplings. A warning! If it's not driving itself forward or reverse it's a handful. At times you have to muscle it for tight turns, or maneuver out of drive. I'm a fit, elderly 175 pounder and it can be quite an effort. So don't get a bigger one than you really need. Purchased the 14.5 Pro in 2013 and it's been the best investment we've made for keeping up with the property. I keep about 5 acres clean with this beast. It goes through just about anything, thick, thick grass next to the pond or 5 ft tall weeds. Always starts right up too. Don't know what we'd do without it. Arrived in a few days,well packed and as described.Have so far used it once and has delivered as promised.The unit is rugged and instructions were excellent.Looking forward to using it a lot! I bought this mower to take down dense 5' tall canary grass in the immediate living areas and in steeply sloped places that I could not get a tractor driven brush hog into. I'm glad I sprung for this mid-class field mower because it easily powers through the dense tall grass. Electric start is also a great feature as my wife would also be using the mower as well. The stock blade does a great job and I am eager for the heavy duty blade I ordered to come in to see if it makes a difference. I've had the 14.5 HP Pro for about a week now, and it's doing the job really well. I have several acres of grass and brush, and it's melting away before my eyes. My only complaint is that shifting from reverse to any other gear is a little "uncertain" at times, but I'm getting used to it. Otherwise, 5 Stars! Being a "flatlander" as the resident mountain folk call us I had some reservations about being able to maintain our 7+ acres. My wife and I did our research and bought the 14.5 hp mower with great results. It showed up without a scratch, went together easy and after adding motor oil and fuel it fired right up. It eats anything in it's path, handles rough terrain with ease and is very agile. The blade is fairly heavy-duty and has hit several large rocks without taking damage. It pulls itself out of rough spots and can motor along at a fast walking pace making the long flat spaces a breeze. All in all a fine piece of equipment that we'd buy again in a second. Looking forward to many years of easy land management. I purchased my new 14.5 HP Pro at the local ACE hardware store in Oakhurst CA. This made shipping, receiving and uncrating a whole lot easier. It cost the same and it was ready to be use with gas, oil and the store even tested it. I looked at several other brush cutters manufactured by other companies and they all had skinny tires that were only 1-1/2 inches wide and small motors. I am using my DR Pro in the forest, with lots of leaves, pine needles and soft ground, on a slope. Traction is not a problem. The tires and locking differential provides all the traction needed to climb a 20% slope while cutting. I am cutting for the first time a dense woody fern called bear grass about 2 feet tall. I can not walk through this bear grass... you will get stuck and fall down. The DR Pro has no trouble clearing it and will cut down anything in its path with 2,800 RPM's and 1st gear. The reverse is a very useful feature, due to the weight of the DR Pro and it will cut in reverse... others manufactures that I looked at will not. Weight and balance is perfect, even on a 20% slope. The side discharge is very importance and there is no flying cut waste. All I have to do is walk behind it. The machine is built very solid and I have only used it for about an hour but it is a great machine. I am concerned that I have had so many warnings about using it on slopes >20 degrees. I don't know how to judge the slope accurately but I have so many places I would love to use it but am limited there. For my use, I really want something that can be used on slopes without fear! Again, if someone has flat ground, this machine is a bear and I have no doubts it will do everything it is advertised to do! Response from DR SupportThank you for providing feedback on your DR® Field and Brush Mower. The recommendation for using the machine on slopes that are 20° (or less) is two-fold; ensuring that your engine is always receiving the appropriate amount of oil as its running & to make certain you are mowing in an area that is safest for the operator. If the operator can walk comfortably on the slope that is being mowed than you are likely fine mowing in that area. Here are the safety tips as noted in the Operator’s Manual: Always Always mow across the face of a slope; never up and down. Exercise caution when changing directions. Always remove objects such as rocks and tree limbs Always watch for holes, ruts and or bumps. Tall grass can hide obstacles. Never Never mow near drop-offs, ditches or embankments. Never mow on slopes greater than 20 degrees or any excessively steep slopes Never mow on wet slopes. Reduced traction could result in slipping Thank you for choosing DR° Power - we appreciate your business and hope to hear from you again. most of the changes on the new mower seem very good, I've notice that mower doesn't steer as good with wheels unlocked as my old mower it take more muscle on my part,I geuss time will tell if it last as long my old mower. I love the power. The machine does not bog down. Works great on flat terrain. However,on hills the mower wants to raise up in the air or one of the wheels wants to raise up as well. I am still using and testing to make sure it is not the operator. I hope I can correct this problem. Response from DR SupportThank you for your feedback on the DR® Field & Brush Mower. We’re very glad you’re enjoying the mower and that it is working well for you. Someone from our Tech Support Department is going to give you a call so that we can find out a bit more about the hills that you mention. Keep in mind we recommend that you use the Brush Mower on slopes 20 degrees or less. And the best way to determine this is if you can walk comfortably on that hillside. We’ll give you a call so that we chat about this further. Thanks again for your review and we certainly appreciate your business! First, this machine will eat just about anything. I've taken down six foot weeds and five foot saplings. The power of the engine is enormous. Four different speeds give you great control. Reverse is a must. Assembly was simple and quick. It took longer to get it out of the crate than it did to put together. Has started with ease. The only thing that I've had issues with is the fact that I was trying to handle it as a lawnmower, in other words, to twist 180 degrees like a lawn mower. It's too heavy for that, so don't try it, especially in fast speeds! I've since learned my machine. I have used it every day since I received it. I love it, and so will you!!! After a small hick-up on a bad neutral safety switch customer service shipped me 2day high priority, she fires up every time now. This beast has been clearing my very uneven and hilly forest over-growth like a boss. I bought/installed their heavy duty blade accessory. This machine with that blade easily mows right over my wild maple saplings. The reverse is a back saver in tight situations. The traction lock feature is a godsend. Love this machine!! Thanks DR for another awesome piece of DR equipment to add to my existing DR equipment collection. I purchased this brush mower to tackle the side hill I have on my land. I had no problems putting it together other than it was missing the belt that drives the mower deck. I had ordered the maintenance kit with it so I had to use that belt. (the reason for the 4 stars). Hands great walked the hill cutting down little trees and brush with ease. Thanks for making this great little brush mower. Response from DR SupportThank you for your feedback on the DR® Field & Brush Mower. We’re very glad you’re enjoying the mower and that it is working well for you. We apologize that the blade belt was missing in the machine shipment. A replacement belt order has been entered for you and should be arriving in the next few days. Please know you can always call us if you ever have any questions or concerns. We are always happy to help. Enjoy your new DR® and thank you so much for your business! heavier than my old one but just as useful. I have an original model from 2001 & with minimal service cost & time she has always started and performed. Arguably the best outdoor power tool I have ever owned and I have a shed full of outdoor power tools. My mower had a defective compression release valve, making it impossible to start. It took a while to diagnose that problem and resulted in my buying a replacement battery and receiving a replacement from DR. Onice the problem was finally diagnosed, DR exchanged the mower for another without charge. The replacement starts immediately, as it should, and runs like a champ. It's a well-made, heavy duty piece of equipment that does everything it's advertised to do. It's too bad that the first machine had a defective motor, as it cost about three weeks to straighten it out, but I'm happy with the machine I ended up with. Response from DR SupportThank you for your feedback on the DR® Field & Brush Mower. We apologize for the bumpy start and are glad we have been able to resolve the matter. Sounds like you’re now off to a good start now and will have many years of use with the DR®. It is a rugged piece of equipment and should serve you well. Thank you for your patience and we appreciate that you chose DR® Power. We look forward to hearing from you again! Best purchase I have made in power equipment. If I sound like an advertisement, it is because I LOVE THIS BEAST! Power, ease of use and excellent functionality. This product performs. Bad to the Bone. Everything I thought it would be and more. The 14.5HP field and brush mower lives up to all of the advertisement claims, including mowing down heavy blackberry growth. The only caution is to inspect the machine thoroughly. Upon opening the shipping crate, I discovered a loose bolt, washer, and nut. This fastener came off of the negative side of the battery. If I had not noticed the bolt assembly, it would have been lost. Finally, upon inspection I found the nut holding the wire on the starter had backed off halfway. I use this powerful tool to cut through brush and it works as advertised. It takes a little time to learn how to use it efficiently so I spent 30 minutes "practicing" before using it in areas where I needed to control it well (just like breaking a horse before riding in rough terrain). Very well made machine and excellent owners manual. Thanks! Nice machine but you need to do some work on delivery options. I was advised that Yellow Freight in Cheyenne would load the crated unit on my trailer. They were not capable of doing so which resulted in building slides from the dock to my trailer. A major pain. This is a heavy piece of equipment! I have pain in my wrists from arthritis, but I can let the mower do the work. It does everything that it is supposed to do with seeming ease. My only complaint--gear shifting is really tight. My D.R mower has done a good job of my overgrown pasture, and now I am working on the brushy undergrowth around my trees. It is taking on some pretty rough stuff, and not hesitating a bit. Too hard to turn - Wheels on mower deck, one wheel brake lock, double clutch is a small problem. starts easily, runs well. The spark plug wire got damaged in operation among trees - armored wire? Response from DR SupportThanks for posting a review with suggestions. We are constantly looking for ways to make our products better & will provide your suggestions to our Engineering Dept. We will get it touch with you about this. Great purchase, mows everything in its path. The differential lock on the hills is an absolute benefit. I have rented others without this feature and was unable to mow safely several areas on our property. One addition to the start-up procedures in the operators manual would be to add the following,"ensure fuel shutoff valve located below the fuel tank is opened prior to starting". After shipping the brush mower was easy to assemble, easy to start and fully met my expectations. In terms of its reliability and durability only time will tell. Thanks for your excellent customer service, which I also anticipate in the future. Full disclosure, I am a longtime DR customer and have several of their products. They make and support some of the best made products I've used. I bought this mower to replace my DR Trimmer which had been stolen recently but had worked exceptionally well for the past 15 years. Usage: 80 acre ranch in South Central Washington State, high elevation with grass lands, dense shrub and forest. Primarily bought to use clearing grass and light brush. Ordering: You have to call during their business hours to get a person. It took me a few days to work out the timing since I’m on the west coast. Once ordered I was told that I would get email that my equipment was being built. I called back repeatedly and never got a single email despite checking my email address multiple times. To this day I haven’t gotten any sort of order email from their system. Shipping: Free Depot shipping. You have 48hrs to pick it up. Given that I didn't really have any idea what day the shipment was coming in I got lucky in that I could pick it up on a Saturday that I was free. Setup: The instructions are pretty clear although the machine setup and engine setup are in two different manuals. When I ordered I explained that I would be setting my machine up in a very remote location and I needed to know all tools and supplies necessary. They unfortunately didn't tell me that it didn't ship with oil for the engine. Many products ship with external containers of oil to put in the engine for that first run. In my case again I got lucky. When I ordered the mower I also ordered the maintenance kit which included two quarts of oil – thus avoiding the 2 hour round trip getting oil and back. The mower also ships with the battery disconnected if you have that model. In my case the negative terminal was disconnected. Unfortunately the bolt for the connection was nowhere to be found. Fortunately I had an extra bolt/nut for some other work I was doing. Mowing: The machine is a tank; it can cut just about anything down within the recommended size range. The engine is low and hearing protection is required when in use. It starts easily. A few times I ran into the issue of engaging the wheel lock (both tires turn under power) and disengaging but it didn’t release. The machine is heavy and when trying to turn it on a hill with the wheel lock engaged was a real pain. I suspect it was possibly because of the steepness of the grade I was working on. I also notice that the blade has several dings/dents in it due to hitting rocks that were part of the landscape. Hopefully won’t degrade performance too badly. Overall: Based on my experience this is a great mower even with the few hiccups I ran into I still feel like I had a relatively smooth experience and look forward to years of quality use. Outstanding product! Very powerful! A quality piece of machinery. I have the 1999 version with 12.5hp and 26" deck. It has cut everything in it's path up to 1 to 1 1/2" brush/small trees. Ran over rocks up to 3" hidden along plowed field edge, and low cut stumps. You name it, it has been hidden in the tall grass/weeds, the unit is built to take the abuse and protect itself. I have replaced the drive belt, blade spindle, and brake clutch assembly due to damaged caused by 15 years of use and abuse. Country Home supplied the parts in a week! Great investment! I have since bought the road grader and found the same quality. So far, this has been a great product, and is accomplishing what I purchased it for. I'm considering selling my 27 ton wood splitter in order to purchase the DR Rapid Fire splitter! Anything to help save time with chores is money well spent....Now, do they have a skid loader? I couldn't be more pleased than I am with my new DR mower. By the time I decided to "pull the trigger" and purchase my mower, things were getting a little out of hand around the acreage. I had a half acre of three to four foot tall sweet clover and assorted other stuff just north of our barn and I thought to myself "Lets put it to the test." Every other walk-behind mower that I've used over the years always needed to make two passes to handle anything this tall so I was skeptical- as I started to mow, I actually thought to myself "I could be making an ad for DR!" I was really impressed with how it not only cut all the stuff down but pulverized it and kept right on going. I didn't have to lift the mower deck up to keep it from bogging down as I've done with rental machines. The way the mower deck swivels is useful as well because I do have some uneven terrain amongst my trees- why I've never been able to use a rider mower of some kind or another. The reverse gear lets me mow up to and under some larger trees without having to "wrestle" the mower back out, too. Two of my kids want to run it but I've been having too much fun myself! I feel very confident that they can handle this machine safely and,of course, that is most important to me. My future son-in-law was most impressed and even told me about seeing a Department of Transportation crew using a DR along the highway on his way home from work. I couldn't be happier with my DR mower! P.S. I intend to buy the snowblower attachment this fall to use on our two drive-ways. Cutting trails and taking names!! I am using the brush mower to cut and maintain trails through about 70 acres of Wisconsin woods. I purchased the maint. kit and got the heavy duty blade. Believe me, the standard blade is plenty heavy, but the heavy duty is a monster. This is doing a fine job in blazing trails through my woods...I can only imagine what the larger HP models could do. Since I live out of state, I need to accomplish things fast when I have the time to get up to my property. DR is sure making my life easier and more productive. I also have the 9HP stump grinder and will soon have a wood chipper. These products are not cheap...but they do the job, and work when they are supposed to. Good purchase does what it is designed to do. Great product would like to have the option that you could lock on wheel to help turn the unit around. I've owned the 13 HP model for over 5 years and love it. I could not maintain my country property without it. It is rugged, climbs slopes and cuts grass, tall weeds and smaller saplings with relative ease. The chain master link just broke on it but, other than that, it's been repair free. I owned an Original DR [the one with the big bicycle-like tires] for 22 years and used it to clear a portion of my land that was heavy with brush and multi-floral rose brambles. It has always worked flawlessly, but the lack of a reverse gear made it's use more challenging as I have gotten older and "bossing" it around became more difficult. This past summer DR offered me a special "original owner" discount and along with the 36 mo. 0% interest, it made an upgrade to a new 14.5hp model very attractive. The new one is a much bigger and heavier machine, but the multi-forward and reverse gears make it manageable. Plus I like the option to add other devices like the snow thrower, which I probably will do when my snowblower either dies or I decide to sell it. My old DR lives on as I sold it to a friend who needed one, but his land is not as sloped as mine so he shouldn't experience the handling challenges I had using it on my property. This is my 2nd DR Brush Mower. My first one still works but needed to be retired after 13 years of rugged use. I live on hilly land and have lots of trees making a tractor with bush hog impossible to use. The DR gets into places where no tractor can go and it does the job in my opinion better than a tractor. Does The Job Okay; But Where is the Bladeless Mowing Attachment? I finally got this mower unpacked and assembled (easy) and the shipping crate was sturdy. Does a good job with tall grass and saplings. Will get to "missing" if the hill incline is too steep, particularly on a slant. I've run it a total of about 20 hours now and have noticed the spark plug fouling already as well. But the mower does its job and I am pleased with it. I order the "Bladeless Mowing Attachment" for the thing and it appears I only received part of it...the heavy duty string...is there a holder for this or something? Response from DR SupportWe appreciate you taking the time to post a review. Thanks for doing that! The Bladeless attachment is on the way. We apologize for the delay! Thanks again for leaving a review. We’re glad you are enjoying it! We purchased a 4 acre property, with at least 3 acres of brush and briars. On the weekends we have been clearing the land. I could not have done without the DR Field & Brush Mower.The DR is able to get into areas that a tractor could not go and I have much better control. The mower has left behind nothing but a trail of mulch and several large sticks that I will use my Chippper attachment to complete the job. Overall I am very pleased with my purchase, thank you DR. I like the mowing attachment better that the brush mower. Well! It takes two guys to change from Bush mower to lawn mower. It "tain't easy McGee"! I miss the ease of turning by squeezing right or lett brake like my WARN- OUT JOHN DEERE 48 INCH WALK BEHIND. HINT ! HINT ! Machine is great. Customer service was very helpful in getting it here. Only issue I had was one of the bushing on the deck needed some rework to get it onto the mounting shaft but once on the machine works great. Very happy overall even with that. Does exactly what DR says it will do with no compromises. After a historically wet spring, trying to reclaim a 10-acre farm that?s been left untamed for the better part of the last decade was a daunting challenge. We couldn?t find anybody willing to tackle the overgrown brush, invasive weeds and junk trees that sprouted up all over. We bought the field and brush mower because we felt like we had no other options. Best thing we ever could have done. After the first day of clearing brush a farmer who lives nearby stopped after noticing the progress and the first words out of his mouth were, ?What, you get a DR?? That was the first of many similar comments. Even the local farmers knew the only thing that could take on our property was the Field and Brush Mower. Very easy to use over uneven terrain, goes through anything and everything and really smart and well-designed for easy maintenance. My wife?s theory is a woman had to be one of the engineers because even she found it easy to use. Best purchase for our property we could have made. Have had it for years, maintained as specified, still running and doing what it should! Aside from the fact that it has more than enough power to tackle anything I've used it for, and that it keeps on running-yes I maintain it on a regular basis-clean it, keep oil, etc. fresh and replace regularly. This machine met all my expectations. I purchased this machine to replace my 1996 Model DR field and brush mower. It has all the features one could ask for in a heavy duty brush mower. I have several acres I can mow with this machine that I could not mow with the older model. The large tires work excellent in muddy conditions and the floating deck gives an even mowing job. Best of all, I think, is the geared transmission, especially the reverse gear function. Makes turning around much easier. Overall, this machine is worth every penny. My primary use is to cut my roadside ditches and along my fence lines. My old DR had the wheels inset to the cutter deck and the drive lever was on the same side of the mower as the discharge. This allowed me to drive the mower along my fence lines with my hand clear of the pinch points of the mower handle and the fence (posts and wire). The opposite is true with the new mower. Therefore, I cannot get as close to the fence as I would like. Overall the new mower is much improved in efficiency and ease of operation from my 18 year old model. This product has performed as advertised, however the cut result in tall grass is not as clean as I would have expected. Does the job - you need to work, too. The machine performs as advertised. I have used it to clear brush, saplings, and vines. Mostly used for clearing and maintaining trails on our property in western North Carolina. It does well on steep terrain and between trees where the tractor cannot go. It is quite a workout! Even though it is self propelled it is a load to guide and turn. The locking differential is a help on slopes. I have only used it for a few hours, so I cannot comment on reliability. It appears to be very well built. It cuts the stuff they say it does. I bought one, used it, and it works. I have a lot filled with broken pine trees from a winter ice storm. The DR allows me to cut close to the fallen trees thru blackberry bushes and honeysuckel vines so I can saw up and depose logs. After unpacking, assembly, and reading the operator's manual the unit was a dream to operate. It is more powerful than I originally thought, and cuts weeds and small trees without laboring. I have yet to attempt to cut kudzu, but from what I have seen so far, it should not be a problem. I could have used such a piece of equipment years ago instead of common mowers that bog down. I like the DR products and have several. This mower is good. But if you don't need to cut big saplings get the smallest one because it's a beast to manage, esp if the terrain is rough. Great product for cleaning up natural growth in the Carolina mountains. Customer DR service group gets it- all about understanding your needs and then helping to match them with their products. CS worked to get me the best product for the best price. We are using the mower to cut down 6' grasses, weeds, and some 1" thick tree type growth. We cut 3 acres with it this year, and there will be 3 more acres to do next year. My wife can handle it, and we are both in our early 60's. I don't think we could have gone with a smaller engine for this...we went with the 14 .5 HP. The only change I would make would be the gearing. For the work we are doing, the gearing either seems to be a bit too slow, or way to fast. The main view from our home we build in 2008 is an eight and a half acre pond. I had to fight my husband every time to have someone at least once a year go around its banks with a weed eater and bush ax to clean the tall grass and brush around it. It took one man four days to get it cleaned up. I made a Giftcard for Christmas 2012 with a picture of the Dr.Power Field and Brush Mower and made it a one half interest for my husband and one half for myself. Our new Field and Brush Mower did the main job in six hours and the rest of the day was for treating the little areas we could not get into with the mower. The next jobs will be clearing hunting trails and wildlife food plots. The 14.5 HP is just the right size, it has power, it is not too heavy, thus easy to manover. I was a little worried about buying this machine. My brush-hog was too big to move around all the trees on my property so I needed something that was still tuff but easier to mow with. This is the cats meow. I sold my brush-hog. The machine plows right through heavy brush and saplings with little effort. The motor never labors in fact it never change RPMs. I love it almost as much as I love my wife and kids. Bought the DR Brush Mower 14.5 hp for our 4 acres. It's a commercial-quality beast. Does the job, seems very well built, uses gas very slowly. It was easy to learn how to use, I was off and running in about 10 minutes. My only observation is that using this thing is hard work (unlike the sales videos we watched where grandma and grandpa were taking turns mowing the farm). Your left hand gets sore after engaging the clutch a while, and maneuvering the 350 lb. behemoth around objects takes some strength. If you are weak or frail you're going to need someone else to do the mowing. Mows everything it says it would. I am clearing approx 3 acres of a 10 acres parcel. I am very impressed as to how much brush this will cut if you take it easy and go slow. I have many 3- 4 foot tall sage brush with 1-2 inch trunks that this machine will cut down. You do have to tilt the deck upward when approaching this kind of brush and lower it onto the bulk of it other wise it may push it down instead of cut it. Over all its great and love that I chose the bigger model.. THANKS DR !! I have owned a 15 HP brush mower for about 11 years. While I find it very hard to control on the sloping hills in Western North Carolina ( it works you very hard) the Dr can cut anything I ask of it. I have cut about 3 1/2 acres of grass and small saplings that was over knee high without stressing the mower. THIS PIECE OF EQUIPMENT IS EXCELLENT FOR WHAT IT IS DESIGNED TO DO AND PLENTY OF POWER! WE ARE USING IT AT OUR RANCH AND THE ONLY PROBLEM IS THAT VINES GET TANGLED IN BLADE AND IT WANTS TO CLIMB THEM INSTEAD OF CHOPPING THRU THEM. OTHERWISE - GREAT MACHINE! When you have a quality machine you'd think that you could also put a quality battery in it. Very frustrating to have it not last the first summer and what an awkward thing to get out. Little things can sour a person quick. Response from DR SupportWe thank you for leaving a review, but are sorry that you have had an issue with the Battery. Please make sure the 20 amp Fuse under the Fuel Tank Mount hasn't blown. It is in the charging circuit and allows for the Engine to recharge the Battery while running. We have 40 acres of hardwood forest with tall grass and fiddler ferns. My wife and I were able to clear several walking trails thru some very heavy under brush. Anyone who wishes to clean up their property, this machine is a "must have". We own a 35 hp 4 wheel drive tractor with a 3 pt brush hog, good for field clearing, but it can not get into areas this DR self propelled walk behind does. The only downside is the protective cover. It was sent to us and the quality was less than expected from DR. They did replace it, but the cover is not designed for covering a unit with the light accessory attached. Other than that issue, this machine (14.5 hp Model) is a "Hoss" Thank you DR.
mowing 10'+ sunflowers with ease. before and after. cant stop the power of DR.
My DR2 brush & field mower has served me faithfully during my six year ownership while clearing my 3+ acre " jungle". Briars, brambles, weeds, saplings, underbrush & small pines trees were no problem for my machine. Even when working on damp/wet ground , it kept on performing well. The engine performed flawlessly and I like the full pressure oiling & the oil filter for long engine life. The three year warranty was helpful when needed. The power unit is also very handy to power my DR2 generator during hurricane power outages. Thanks for a great American product. This equipment is too front-heavy to maneuver on a grade around rocks and trees. I purchased this to use on a steep grade to clear out around trees and rocks. But it is too front-heavy to maneuver. Way too difficult to use. It is great on the flat, but for that, you'd be better off using a small tractor and brush hog. Since I couldn't use it for the purpose for which I bought it, I made the situation worse by buying the snow blower attachment, which works but the throw is minimal distance. I feel that I am not able to get enough use out of this equipment to be worth even a fraction of what I paid. I've tried to sell it unsuccessfully though it looks brand new and has almost no hours on it. Response from DR SupportWe thank you for posting a review. We're sorry it isn't going to work for your needs. It is a heavy machine and the steeper the angle the harder it is to maneuver. The Snow Blower, depending on moisture content, should be throwing up to 20-25 ft. We will pass your information on to Product Development for future consideration. Starts easy and will mow thru everything. I have had this unit for about 10 years and still performs great. Great product, mows awesome no matter how high. Have owned this product for a couple of years. Invested in this mower to assist in keeping the fence rows clear, and to get close to the areas where bush-hogging was difficult. The mower cuts with ease, even in the highest grass and brush. No issues with it except broke belt for the self proper once. Not the easest to change, but Im not the greatest at mechnical issues. I would recommend this product to anyone with land requiring clearing or maintance outside of usually lawn work. My wife and I almost argue over who's to operate our DR. We have about 9 acres, mostly pasture for our two horses, and the DR helps keep the weeds down so the grass can grow. The only thing we would've improved (and maybe this was done on newer models) on our 14.5hp model purchased in 2004, is the left-side lever tires out your hand holding it in for any length of time. There used to be a switch-out handle that was easier on the hand, but it's not available any more. We also purchased the snow blower attachment and love the way it easily attaches and detaches from the base unit. It makes short work of any kind of snow, whether its light and fluffy or wet and heavy. The DR F&B Mower is well worth the price. We recommend it to anyone who has a lawn or acreage to tame. The DR brushmower was designed perfectly for it's use. I have 15 acres of fields that I maintain with the field mower, along with about 1 1/2 miles of trails through the woods. Large sections of cherry whips 2-3 inches in diameter and 3-5 feet high, along with brambles, had taken hold in the fields after a few years of pasturing horses. The field mower just ate through it all and left this mulched by product. It was amazing. Using the field mower is so easy and leaves the fields & trails looking great. I have the snow thrower and the 42" lawn mower attachments as well. The quick coupling system is a breeze to use. I clear trails through the fields for my dogs in the winter. During the summer, I can maintain a large amount of lawn in my limited spare time. Year after year I maintain the property with my DR equipment. The products are easy to use & maintain. The functionality of the product is well thought out. . . . size of the gas tank, placement of controls, quick couple change system, blade height adjustments, clarity of manuals, availability of accessories & maintenance items. DR products are dependable, provide a great value and come with excellent customer service. There are no better products for me to recommend. Made in Vermont is icing on the cake. I'm very impressed with the quality of this product. I also purchased the blade attachment, which has come in very handy. Easy to swap out attachments. When I bought my 6 1/2 acres in the country, I could barely get around on it. I still haven't seen it all, however after acquiring my field and brush mower, I'm coming close to seeing ALL of it. I cut down trees, brush and anything that gets in the way and it just keeps going. If and when it needs service, I just call the 800 number and service is on the way. Thank you DR Power Equipment. The Brush Mower is one of the best purchases I have made. I have owned this brush mower with the lawn mower attachment for several years now. I have opened up and now maintain over a mile of woods roads and trails along with small meadows in heavily grown up fields. Keeping trails and roads open and vegetation short make it so very enjoyable. I walk the property daily and don't have to fight the briars and waist high brush any more. And the finish mower is very easy to switch over to and I mow another couple of acres of lawn with it. I gave my old rider to a daughter after I got this mower and I enjoy the excercise I get with this mower. The variable speeds make it very easy to use. This product is very dependable. I have had this product for years and it has not given me any trouble, it cuts where my riding lawnmower can not. This products is easy to use and very powerful! My husband and I are proud owners of a DR Brush Mower. We purchased it about 7 years ago after seeing it advertised on TV. We own a large piece of property where we have a camp and had a large area to clear. The growth is thick thatch and saplings. We had worn out at least three riding mowers, several belts and blades. We were amazed at the power and ease of use of the DR Brush Mower since my husband and I are limited in our physical abilities. All you have to do is walk behind it. We are able to choose the speed and it pulls us along easily. All of our family loves to come to camp to use the DR Brush Mower because they love the power! Our grass has reached knee to thigh high and the DR Brush Mower has never failed us. We absolutely love this machine! Great for clearing overgrown fields, etc. Bought this machine to clear our property in the mountains. We have one field of about 10 or 12 acres that was really overgrown and we had no way of getting a larger machine to it. Took my brother and I about 4 days to do it the first time but now only a day or so as we have kept after it each summer since buying this mower. I bought a referbished DR Trimmer from you about 12 years ago. We have an 80 acre ranch where we raise cattle and have quite a few fences to close off pastures. The DR trimmer has done yoeman work over the years of keeping the tence lines clean. Moreover, with the cutting blade it has made cleaning the pastures and woods on the property very easy. I have had to purchase a new battery for the machine and have the handles re- welded but no other major maintenance was required for more than a decade. In short, it was one of the best investments I've made in ranch equipment! I'VE HAD MY MACHINE 14 YEARS, IT HAS DONE A REALLY GOOD JOB AND IS STILL DOING A GOOD JOB FOR ME. Very good features - we use it a lot on our 160 acre farm. We bought our DR Brush Mower more than 14 years ago to knock down brush and brambles on our large semi-rural property. We share it with our neighbors when they need it so it has had a huge amount of use in those 14 years. We've replaced the blade once and a belt once. Otherwise, just regular maintenance. My husband and I are approaching 70, and though a few hours with the machine is definitely a good workout, it is easy to use and very gratifying. My only complaint would be how tired the clutch hand gets, but I think the newer models have addressed that minor problem. I have owned this mower for a good many years and I love it. It has been dependable,never had any problems and still has the original battery. Have used it hard and put it to bed clean, kept it serviced and it has been exceptional. We hve have had this product for several years. I cannot believe the cutting power this machine has for cutting down bushes. Too good to be true? Not the DR brush cutter. We got ours ten years ago when we first started clearing part of our 30 acres for our bed and breakfast. It has done everything we hoped for and more - we're still impressed with how much it gets done in return for relatively little work from us, from initial clearing to ongoing grounds maintenance. If DR ever makes a riding version of this amazing machine, we want one! We highly reccommend the DR to anybody with brush and other heavy cutting needs. This unit works very good. The string trimer add on is nice for those rough areas with stones. I have anolder model field and brush mower and have put it through some very tough conditions. It has never failed me. I purchased the 14.5 Pro along with a grader blade and tire chains in spring 2011. The machine performs flawlessly for cutting woods trails and knocking down weeds in a one acre field a few times a season. I used the blade to spread 12 tons of topsoil in short order. No snow here last winter but I'm sure I'll get the chance to test it on that too in the near future. This product has been a life saver. I have 10 acres and when we first bought it there was nothing but brush, very tall brush. My DR went through it like it was nothing. This is the best machine I have ever bought. I don't have to fight with it like a regular mower to do a small upgrade, it goes where no other mower can go. and changing the different heads are a breeze. We own three of your products. This is my favorite. We live on a small acerage with lots of brush. It has been an excellent help in clearing the area. Thanks for a good product. I cleared an acre of land using this machine. While I can't say it was easy, at least the DR Mower made it possible. without it I'd still be out there hacking away. This machine can get the job done. It can certainly out last me any day. I actually have the 15 HP Kawasaki. It has to be ten years old and still runs wonderfully. In addition to the field & brush attachment, I have also purchased the 42 inch lawn mower and the snow thrower. All work wonderfully. The brush cutter is a powerful machine and easily cuts through weeds, bushes, and small trees. I have owned the 15hp brush cutter for several years and also have the generator attachment. It easily cuts through the undergrowth in out timber and has always started (electric start) the "first" time. DR Products are the BEST!! We purchased the DR Field and Brush Mower over 20 years ago, so it is not a model currently sold. We are saving our pennies to buy a new one, so we can have a second one available! This machine has held up so well over the years and has survived many operator misjudgments, such as run-ins with fencing and big rocks. It is easy to use, maintain and operate. Men and women use it with equal success. Friends borrow it, we use it every year, all summer long, on various projects. Goes in places that are tough to get to with other machines. So satisfying to see that mound of overgrowth gone in minutes and nice, clean area left behind. Love this product! This product does even more than what your ad's say!! I bought an older model field and brush mower. Where I live is 3 acres. I worked all the time and the yard grew to look like I lived in the forest. After working with my field and brush mower my yard now looks like it should. The mower cut down all the tall brush and up to 3 " trees with ease. I have taken back my yard and I owe it all to the field and brush mower that I own. It is all you advertise and more. If you have a place that has grown up more than a regular mower can handle I will tell you to get a dr field and brush mower. You won't regret it!! Excellent engineering & use of high quality steel and mechanics. My DR Field & Brush Mower turns heads each time I use it. The pivoting mowing deck allows the machine to glide almost effortlessly. With five forward speeds and one reverse there's no sore back or strained muscles when the job is done. Truly; the absolute best power tool I've ever owned. The DR Field & Brush Mower does exactly what the ads say it'll do. And it does it safely & efficiently. This is my absolute favorite piece of power equipment to use. It performs exactly as advertised, if not better. I have a small field that keeps getting bigger every year because this mower is such fun to use. It is well built and tough. My machine does everything it is claimed to be able to do, and then some. I've had it for many years and it still works like new. I have enjoyed using the DR products I purchased. The brush cutter starts easily. It performs well and meets all expectations! The gears allow the speed needed for each condition. It has adequate power and I've never been disappointed in the DR brush cutter. There are no bad points. I would like to own all the DR products. I like this product a lot ,powerful, agile ,and long running time.I'm excited I just bought a new grader blade and can't wait to try it out. Only complaint is skid is open and gets caught on roots etc. I've broke it off once and had to have it weilded and also bent it several times and had to bend it back. Replaces tractor drawn bush hog for ease of use. this machine does a good job but is a little heavy. Turns good and performs great. A real walk behind brush hog.. I mow a two acre field and use the Dr field and brush mower with the 42" lawn attachment and it does a great job and is so easy to use, all you got to do is walk.. How much easier can it get? Cuts great and does a great job. When my husband purchased a DR Mower I mistakenly thought it would be his new ?Power Toy.? Being originally a city kid I never thought standing behind a mower would give me such a rush. With 20 acres of rural Virginia landscape to maintain, the DR mower made the job not just manageable but fun and exciting. Watching untamed land turn into a vista that rivals the local state park. On a scale of 1 to 5 with five being the best I would have to give our DR Mower a 6. The DR Field and Brush Mower has been an outstanding performer over five years. I cut brush up to five feet high with stems as thick as 1.25 inch in clumps of five or ten. The DR powers through and chews up and spits out what's cut. The high hp motor never drags down, and I've even cut a rock or two (by mistake only!). With ten acres of pine and juniper in the Arizona White Mountains, the powerful engine has never hesitated though the elevation is over 6,300 ft. This is one great machine, and I've never been disappointed over a five year period. It handles steep grades well, although caution and good training are necessary. You can never go wrong with the DR Field and Brush Mower. It performs as advertised, even among towering Ponderosa pine trees. Soon the scrub oak brush is gone! With my DR I cleared the field by the pond of all the brush and weads and essentially put the DR out of work. That is how GOOD it is. Quaility piece of equipement will recommend. It cuts well and makes the job easier. Excellent for field use or high weeds. I love this product so much that I'm going to purchase the tow behind next. You will not go wrong with this product. Best for cutting a large area of weeds. Cuts through it like butter. This DR Mower is the greatest mower. This mower is easy to use & with it being self-propelled it make is great for mowing pond dams and roadsides. The DR ALLTerrain mower exceeded its advertised performance. With my DR ALLTerrain mower, I cleared brush, small trees, shrubs, saplings from 4 acres. A.The pressurized oil system on the 14.5 HP Pro Self-Propelled Walk-Behind Field and Brush Mower is well suited for mowing on up-to-20 degree slopes. This model mower is great for mowing very heavy growth such as tall or wet grass up to 4 ft. high, brambles and brush up to 8 ft. tall, vines and dense thickets and small saplings up to 2.5 in diameter. This model comes with the 26 brush deck and accepts all optional attachments. Q.How does the mower avoid hidden rocks and stumps and what happens if you hit one? What happens if you hit a hidden stump or rock? A.The Self Propelled, Walk Behind Field and Brush Mower has a pivoting mower deck that automatically follows the contour of the ground and has a fixed 4-inch cutting height. Hitting a rock or stump can potentially damage the blade or blade spindle, so it's best to avoid rocky situations whenever possible. However, the DR is equipped with a belt-drive system that allows the belt to slip if it strikes a rock or immovable object, reducing the possibility of damage to the blade spindle and protecting the engine. A.Kryptek® Outdoor Group is a veteran-owned business recognized as the leader in cutting edge camouflage innovation. Their camo patterns were designed as a result of many years of tactical, military, and hunting expertise. Unlike traditional camouflage which repeats a woodland pattern, Kryptek patterns have a three-dimensional effect with varying geometric shapes in the foreground as well as complementary shading in the background to create a heightened depth of field. “Battlefield to Backcountry” aren’t just words, they are Kryptek. Q.How is the camouflage pattern applied to the AT4? A.The camouflage pattern is applied using a specialized powder coating process where the ink is actually fused, at the molecular level, into the powder coat. This process ensures a tough, durable coating resistant to scratching and fading unlike cheaper and easier to apply hydrophobic coatings. Please feel free to contact us again if you have any other questions.